A short video about why I wrote the book. Produced by Tower Hill Films. My name is David Kotelchuck. I am Professor Emeritus at Hunter College in the field of Environmental and Occupational Health. I am also a political activist, beginning with the struggles for civil rights over five decades ago and more recently protecting and advocating for worker safety and health. 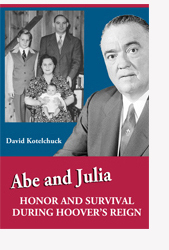 I started this website in 2016 to provide documentation and background information for a book I recently published about my parents, entitled Abe and Julia: Honor and Survival During Hoover’s Reign (Blue Thread Press, Accord, NY, 2016). Abe and Julia Kotelchuck were Communists and loyal Americans whose lives were disrupted and civil liberties violated by the Federal Bureau of Investigation (FBI) during the 1940s through the 1960s. After my retirement I had the opportunity to read carefully the 2,200 pages of files which they had received under the Freedom of Information Act (FOIA), most of them FBI files. What I found appalled me in its lawlessness and was far worse in my opinion than the overt harassment I had observed growing up in this family. Much of this is documented in the book on Abe and Julia recently published. It can be ordered from the Jewish Currents website, as well as from Amazon. In the book about Abe and Julia I have quoted extensively from reports and communications by J. Edgar Hoover to and from various FBI field offices. I believe it is important to provide readers access to scans of selected original documents contained in my parents’ FOIA files. These documents are identified in the list below by the designation RP (Reference from Page) followed by the page number in the text of the book Abe and Julia: Honor and Survival During Hoover’s Reign. Please click on the links below to view these documents, as well as related excerpts from the book.